YogaBox Everywhere?! Win FREE Class! What can boxing do for you? The Fitness Magazine link below was ultimate stress reliever for Caroline McDavid-Seidner and helped her lose 115 pounds. What can yoga do for you? TEDxTalk yoga teacher used yoga to help criminals reconnect with themselves to find their way back to living with society. What about boxing and yoga as a combination? We think you can use the boxing for stress relief (aka getting your agression out), cardio workout, self-empowerment and muscle strengthening … BOX IN. And the yoga for core strengthening, flexibility, lengthening, focus on the moment, and stress relief … YOGA OUT. BOX in … YOGA out for a full mind, body and life workout in just 75 minutes! We hope that you can join us on Tuesdays for YogaBox™ starting at 9:00 am and ending at 10:15 am. It’s a New Year and NOW is a great time to make the time for yourself to reach your fitness goals! Will Boxing Help Me Lose Weight? Pummeling a punching bag is the ultimate stress reliever for Caroline McDavid-Seidner, 25 and helped her lose weight. Can Yoga Help with Addiction Issues? Can you spot this? Dawn has been finding boxing images everywhere in Newton! 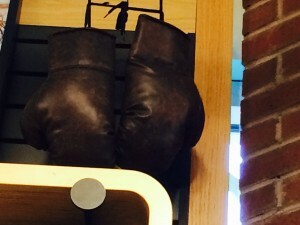 Do you know where she found this pair of boxing gloves? Hint: It’s a place that might really like YogaBox! Leave your answer in the comments below. First person to get it right wins a free YogaBox class! Category: Spotlight · Tags: Yoga and Boxing in Newton, YogaBox Everywhere? !